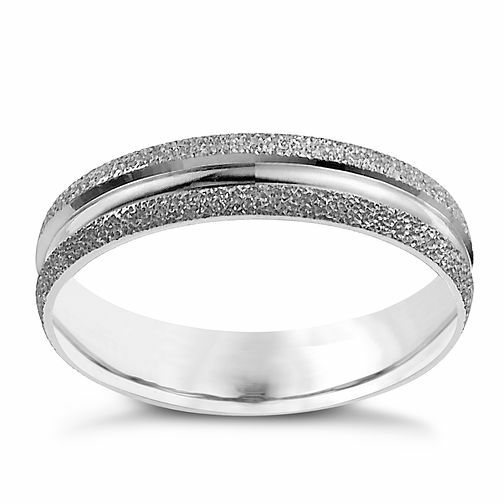 A slim, 9ct white gold ring, finished with frosted edges for an individual touch. The perfect piece of jewellery for simple, everyday chic. 9ct White Gold 4mm Fancy Ring is rated 3.7 out of 5 by 17. Rated 1 out of 5 by Anonymous from Snapped !! While on finger I’ve had this ring nearly a year and only been wearing it for 7 weeks since I got married!!! Was going about my usual work and gym and found it was stcraching my finger looked at the ring and it had snapped no reason for it either! It’s even started to snap in another place!! I got it engraved as well ! And after reading another comment about this ring snapping I can’t believe they are still selling at the same price! Wedding rings are meant to last forever and it didn’t even last to 2 months well upset and furious. Going In to store today to try and sort it ! Rated 1 out of 5 by Anonymous from SNAPPED I’m Absolutely devastated, only been wearing this ring for less than 5 months and it’s just snapped. Like other reviews which sadly weren’t on here when I bought the ring a year ago. It’s now not even under warranty. You can’t replace a wedding ring. I’m so heartbroken. Would advise against this ring regardless of how stunning it is.